This is a simple, fresh look for windows - white for the first two-thirds, with a deep border below in aqua, storm or mix. St. Barts is lighter than our Orkney fabric, but still has wonderful linen texture. 3” rod pocket at the top, 5” closed hem at the bottom. Two-tone not your thing? We make solid curtains in the same pleasing colours. 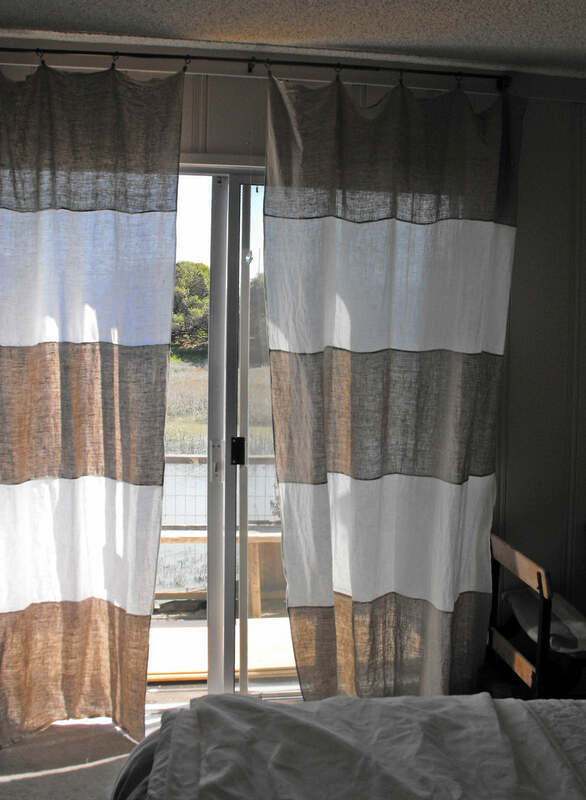 Curtains are also available in Orkney, Smooth and Myriad. off-white/mix / 58" x 84" off-white/mix / 58" x 96" off-white/aqua / 58" x 84" off-white/aqua / 58" x 96" off-white/storm / 58" x 84" off-white/storm / 58" x 96"
I always recommend ring-clips – not only do they draw more easily, you can adjust length and create inverted pleats, even hang a blackout layer without interfering with the flow of the linen. The easiest way to find the ring clips you want is to Google ‘drapery ring clips' and then click Images. No wading through ads or descriptions, just useful pictures. Material: 100% Linen. Midweight "St Barts"
off-white / 58" x 84" off-white / 58" x 96" natural / 58" x 84" natural / 58" x 96" charcoal / 58" x 84" charcoal / 58" x 96" black / 58" x 84" black / 58" x 96"
pure white / 65" x 84" pure white / 65" x 96" natural / 65" x 84" natural / 65" x 96"
mix / 58" x 84" mix / 58" x 96" aqua / 58" x 84" aqua / 58" x 96" storm / 58" x 84" storm / 58" x 96"
off-white / 64" x 84" off-white / 64" x 96"
Love my new St Barts curtains. Makes my room look so fresh and love when they billow in the breeze from the open window. off-white/aqua / 58" x 96"